I've lost my friend of the past 8 years. It's been a long, hard winter for him, and I know he's in a better spot now, but that doesn't make my heart any less heavy. He was my horse, my pet, my partner in lessons, and originally my rescue-- who payed me back many times over with the generosity and heart he gave to my students. He might have been funny looking, and old, but I thought he was beautiful, and always carried himself with pride. It's been hard to see him fail, and so very, very hard to let him go. Occasionally in their career, a riding instructor like myself has the good fortune to form a relationship with a schoolhorse like Kahlil. One that will truly be your partner in teaching under all circumstances and scenarios. 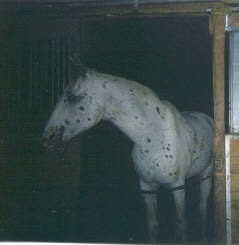 Kahlil was one of those special horses to me. When the auction was over, and I had paid for him, I went back into the recesses of the barn to find him and got quite a shock. Although I recognized him easily by the unusual marking on his rump, without the saddle I couldn't believe it was the same horse. He was emaciated. I also got a shock when I looked in his mouth and discovered he was well over 20, probably over 25 according to his sunken temples. The photo below was taken about 2 weeks after purchase. It was obvious he had been someone's faithful worker, but they had determined that he was no longer useful enough to winter over. Had I looked in his mouth like I always do, I would not have bought him-- another reason I feel it was meant to be. Kahlil (meaning "friend") established himself firmly in the end boxstall, a stall he kept for 99.9% of the 8 years he lived with me. I tried to move him a couple of times, but it always backfired, and he went back to his old stall. 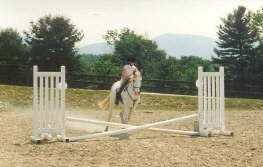 Although the only story I got for him through the auction was that he had been used to pony thoroughbreds to the starting gates at the racetrack, Kahlil quickly adapted to the lesson program, jumping, dressage, 4-H, and all of the things riding lesson students like to do with horses. I think that whatever he was in his former life, he knew that Horse Amour was a place where he wanted to work, and he did his best to fulfill all of my expectations. Kahlil was a powerhouse-- always forward and willing, confident and sure. He was loved by all of our dressage judges and clinicians that consistently used him for lessons. Just this fall, our dressage judge cheered out loud when she saw him-- still going strong after so many years of old age. My lesson students learned to ride on Kahlil. Although too forward for a complete beginner, he was totally, absolutely safe. And all who rode him had the feeling of royalty you get from being on the back of a prancing horse. Never, ever would Kahlil have done anything other than GO. What a wonderful feeling to have alot of horse under you, and yet know he is entirely safe. Never a spook, never a buck for any reason. Kahlil was a multiple times champion in our Horse Trials, both here and away. He never lost his lean look, and therefor never fared very well at the 4-H and open shows, but I know that many a child walked away from those shows thinking that the judge could not see true beauty. Kahlil carried my adults as well as the kids, and those who really knew him felt the same special feeling for him that I have had, and my clinic instructors felt from having him as a partner in a lesson. As Kahlil aged, he experienced numerous ailments that would be expected, but he had an uncanny ability to work things out himself. He became stiff in one hock, to the point where I put him up for sale, sold him the day the ad came out, with a buyback agreement, the people kept him 4 months, their daughter moved up a rank in ponyclub and then they called-- did I want him back? I had regretted betraying my friend, and they brought him right back, he dragged the man down the aisle of the barn and into his stall. I promised Kahlil then, that he would never be sold again in his lifetime. He never took a lame step after that either, but would flex his hocks in the stall if I left him enclosed for too long. He coliced also, occasionally, and would walk himself out in the indoor. The one time I needed the vet was when a well meaning student fed him a whole carrot and he choked. He frequently lost teeth, I've collected a 1/2 dozen of his, and could'nt have had many left. Kahlil attended many away events, until he colicked at the fair-- just the stress of being away from his routine and home. He was a walker, almost continuously, and to be locked in a stall was very hard for him. 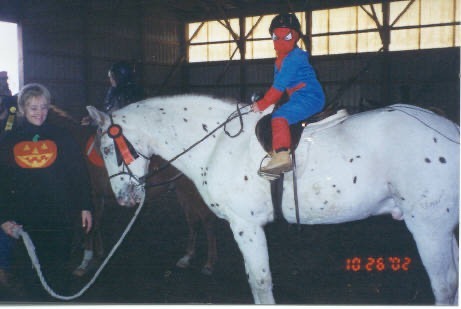 For the past few years his activities were limited to Horse Amour. He really loved it here-- he had executive priviledges do to his previous hardships, and I allowed him free range of the farm. Because he did not really eat hay, he didn't make much of a mess around, and he truly enjoyed himself. Kahlil was an icon here, standing at the top of the retaining wall, or in the doorway of the indoor scanning the valley of which he was king. His health problems escalated 2 years ago to a seizure-- very scary, at which time I stopped using him for lessons. He let me know what he thought of that by simply joining the lessons without a rider. He had joined trailrides previously, when he was pastured with the others and we would take a trailride through the pasture, he would join in-- never last, but right in line and would finish the ride. He was quite intent on partaking in the lessons, and I had to confine him when other instructors or clinicians would teach, because he was so persistent. After a full year of disgruntled retirement and excellent health, my 6 year old daughter volunteered to ride Kahlil in a Horse Trial to test his readiness for lessons. 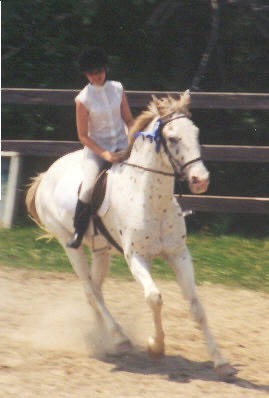 Not only did he complete the 3 phases with vigor, but she placed higher with him than with her regular pony. So Kahlil returned to lessons. Its one thing to have such a trust from your horse that you can set out on cross country with confidence, yet its even more extraordinary to be able to send out a novice rider on this fantastic old horse and know that he will willingly take care of that person for me, the instructor. This winter of 2004, overwhelmed by the # of old horses I seemed suddenly to have, and by the intense cold and my unwillingness to let Kahlil wander about the farm in the snow, I tried for the second time to move him. 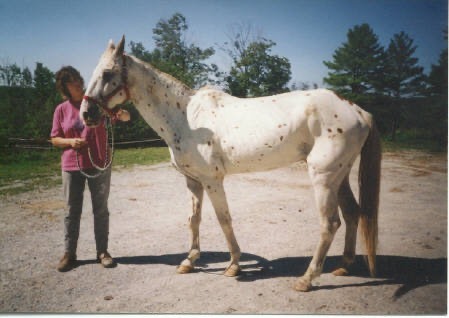 I put him in a wonderful southern exposure run in with another old cadaver like himself-- perfect retirement I thought. But he was unhappy with the confinement. He fell on the ice in February and was unable to rise. Although we righted him mechanically, this led to my decision to put him down-- he was much to independent of a spirit to be saddled with the inability to get up on his own. By some twist of fate the procedure was postponed, and he rose on his own the next day. My campers fashioned him a harness, and he wore it for 6 weeks. We used it a dozen times to raise him with the bucket loader of the tractor, and he got up on his own the rest of the time. My final month with Kahlil was a gift-- I have had the time to reflect on what he has meant to me, to my students who have loved and learned with him and to Horse Amour itself. As the winter dragged on, I made the painful decision to put down two other old guys that were failing-- Bud, whom I'd given away twice and who had returned to the farm skin and bones in the fall, unable to be with the group, and unable to rise easily after rolling, and Duke, my old rescue Belgian pulling horse with ringbone so severe that his joints oozed on a regular basis. When I called the vet to schedule, I booked him for three. On the dreaded day, Kahlil was at his best in a long time. It was a warm March, sunny day with the hope of spring in the air. Kahlil ate his breakfast with vigor, and headed out to stand in front of the barn. I said my goodbyes to Bud & Duke, and told my help to not go ahead with the plan for Kahlil, let's keep him going-- he seemed so happy, and I did not say goodbye to him. I left the farm to (believe it or not) have my very ill 23 year old cat put to sleep. My cat died in my arms in the parking lot of the veterinarian, before she could come out to administer the shot. This is the first and only time I have ever had a planned euthanasia for my animals. When I got home, Kahlil was not on the hill. He was not in the doorway of the arena, no where to be seen. My help was walking down the driveway, covered in mud. The mound from the grave he had dug for Kahlil weeks before was gone, and the backhoe stood over it. My already aching heart broke when I realized someone had made the decision that I couldn't. So, suddenly, today, Kahlil is gone. His presence was so huge to me, particularly as I knew our time was short-- the barn seemed empty tonight, quiet and vacant. I hope he'll stay here in spirit, I know that this was his home, and that he loved it here. Kahlil was a representation of what Horse Amour is. He had been sent to an auction as unwanted, with a little love and appreciation he became everything an instructor would want, and he was glorified here in his own way, which suited him. Although not outwardly affectionate, he enjoyed being loved by the students who knew him. In his final show in October, he placed first in the beginner division dressage.